The war in Syria has lasted for five years so far and claimed the lives of more than 300,000 people. The fighting between the forces of President Bashar al-Assad and rebels has forced more than 11 million people from their homes. Of these, about 2.7 million are now living in Turkey. Three of these people told us which of their personal possessions they grabbed before fleeing the violence. They receive help from the charity International Medical Corps - which first spoke to them as part of their Things We Carry project, funded through humanitarian aid from the European Union. Five-year-old Nizar and his family left their home near Homs two years ago, after it was blown up in an air raid. "The bombers came and destroyed our house," he said. "They shot fire, and destroyed my toys. They didn't leave a single piece of them. "When the plane was coming and bombing I was scared. But I was younger then." 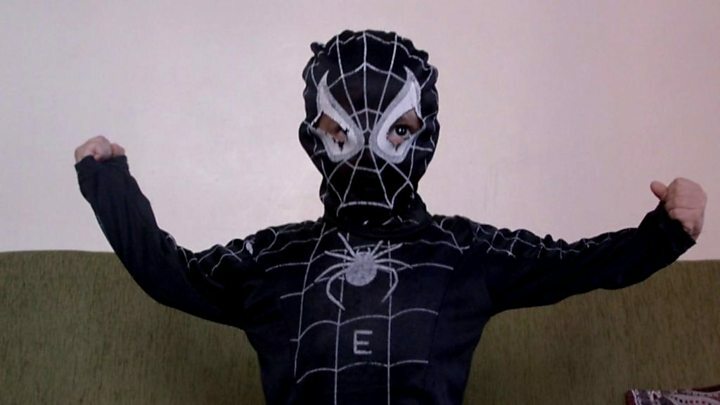 However, when he and his family ran for their lives, Nizar managed to take along his beloved Spiderman outfit. "I took the Spiderman costume and I put it in the bag, and I left. We all left." Nizar says that he feels "strong" when he wears his outfit. "My dad gave me the costume, so I could be a fighter and go fight [President Assad]." Kawther Jahwani lived in a village in the Homs countryside. She fled her home in 2013, crossing into Turkey with a son and a daughter. But another of her sons is missing, arrested by government soldiers who claimed he was fighting with the Al-Nusra Front, which is opposed to President Assad. "I don't know where he is now. I left my home and came to Turkey," she said. "It's been so hard." When Kawther packed a few things for her journey, she made sure she brought her coffee pots, because she "loves coffee a lot". "My grandfather and uncles and husband loved it too. I took this coffee pot everywhere. If I went to a picnic, everywhere. "It stays with me all the time." Kawther was in her house, drinking coffee with about 20 people who were gathered there because she had a basement, when an air strike hit the area. When she left soon afterwards, she made sure she packed up her coffee equipment securely, for the long journey ahead. "I love coffee. Even if I died, I'd drink coffee. I like it more than food, more than anything. If it's morning or night, I'll still drink coffee." Leila, 22, left her home in Kobani with her family two years ago. She has a passion for fashion and designed her own clothes. When the family finally decided to flee the fighting in the city, Leila knew which of her possessions she should save. "I have a lot of clothes and I was packing them all. But the moment we decided to leave, my father was calling us to the car quickly. "So I took some of my fashion books. They came to my mind, that I had to save them, because all my ideas are there, which I've had since I was a kid. "I had many books, around 20, full of fashion and designs. But I only took a few, and some of my clothes." "The problem for me is that when I go back to designing, I go back to the past, because right now I'm not doing much design. I'm working now and helping my family, and can't focus more on my fashion designs, like I did before. "When I hold my books I remember how I was painting clothes and designing, and it makes me feel like I go back in time to when I was making those designs. "It makes me feel happy and sad at the same time." The Victoria Derbyshire programme is broadcast on weekdays between 09:00 and 11:00 on BBC Two and the BBC News channel. International viewers can see clips from the programme here.